Fun With Frisian: Tanke Wol, It Nijs! This is very exciting! The Frisian news site It Nijs ("The News") recently posted an article about this blog! You can read it here: Frysk foar Ingelskpraters ("Frisian for English Speakers"). It, as you will remember, means "it" or "the" and is said with a schwa. UHT. Nijs means "news" and is pronounced with the "igh" vowel in "night." Just think of "the nightly news" to remember this word. NIGHs. 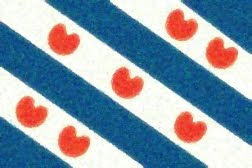 Frysk is West Frisian for "Frisian" and is said with a long "ee" as in the word "freeze." FREEsk. Foar is a cognate meaning "for," "before," or "in front of." Pronounce it with a long "oh" as in "foe" blending into a "w" sound and with an "ah" as in "father." Fwoh-AHR. Ingelsk is the Frisian word for the English language. From what I can gather, you pronounce it with the "ih" vowel used in the English preposition "in" and use a schwa in the second syllable, putting stress on the first syllable. IHNG-guhlks. Prater means "a speaker" and is said with the long "ah" vowel in "father" followed by a schwa in the second syllable. PRAH-tuhr. The verb prate mean "to speak" and is said the same way, only without the final -r-. PRAH-tuh.